I have been using several brands of cotton sheets before but these 100% cotton sheets seem to be a complete difference especially in terms of comfort and maintenance. All the claims and description of these bedsheets are exactly what I found out to be true, they are made of pure cotton, excellently breathable, soft and silky in texture. I really like the sateen weaves used in finishing this bedsheet, it seems to help the material retain its softness and durability and one thing I equally appreciate on this fabric is that it has resisted fading for a very long time. The King size fits perfectly to my bed and I have chosen to purchase the two available colors- The Chocolate brown and Medallion Taupe that I interchange from time to time. The most amazing thing about this product is the way it dissipates heat quickly from my body. I am a kind of person that sweats a lot because my body generates heat quickly under hot weather conditions, but I guess the excellent breathability of this 100% cotton sheet makes me stay dry and comfortable all night, and I didn’t even feel too hot laying on the sheets. I do not have any doubt about the highest quality claims of this product, now I don’t wake up in the middle of the night, hot, sticky and desperate for fresh air like I used to. It’s amazing to actually find a bed sheet that keeps me cool in the warm summer and also keep me warm during the winter periods. It is quite different from the Polyester bed sheets I was used to because Polyester tends to absorb my body heat instead of increasing ventilation. Polyester bed sheets tend to retain my body heat, making it difficult for me to cool down and sleep properly. Cleaning these sheets is super-convenient for me. I love to enjoy those bedtime cozy benefits and these cotton sheets have not failed to keep me warm every single night. I cannot emphasize enough how much quality sleep I have been able to enjoy since I switched to these breathable cotton fabrics. Hopping into fresh and clean cotton each and every time I dash into my bedroom has helped me avoid irritation, especially when I sleep for long hours. Itchiness and irritation in the night have become a thing of the past since I started using these cotton bedsheets. Maintenance of these pieces of cotton sheets is quite superb. First of all, the cotton materials do not require hand-washing, and they dry very quickly, unlike the polyester bedsheets that require several hours to dry. Another surprising thing about these bedsheets is that it is easier to remove even the toughest stains from their surface. I do allow my cat and two dogs to stay in bed with me sometimes, and sometimes they do carry some dirt especially from outdoors, but surprisingly, these stains are removed with a little wash, perhaps the surface of the cotton seems to resist stains to a large extent. I was even more surprised that the price of these sheets is within my budget range and that is a huge plus for me. The sheets are fantastically durable and I always consider the longevity of my bed materials than any other factor because the more durable they are, the more money I save in replacing the beddings. The cotton fabrics go straight into my washing machine, and I usually wash them even at low temperatures and to achieve a better wash, I do wash the cotton alone. I have never use any fancy detergent in washing these cotton sheets but still achieve a very clean fabric after wash. There is no need to Iron the bedsheet even after a wash. 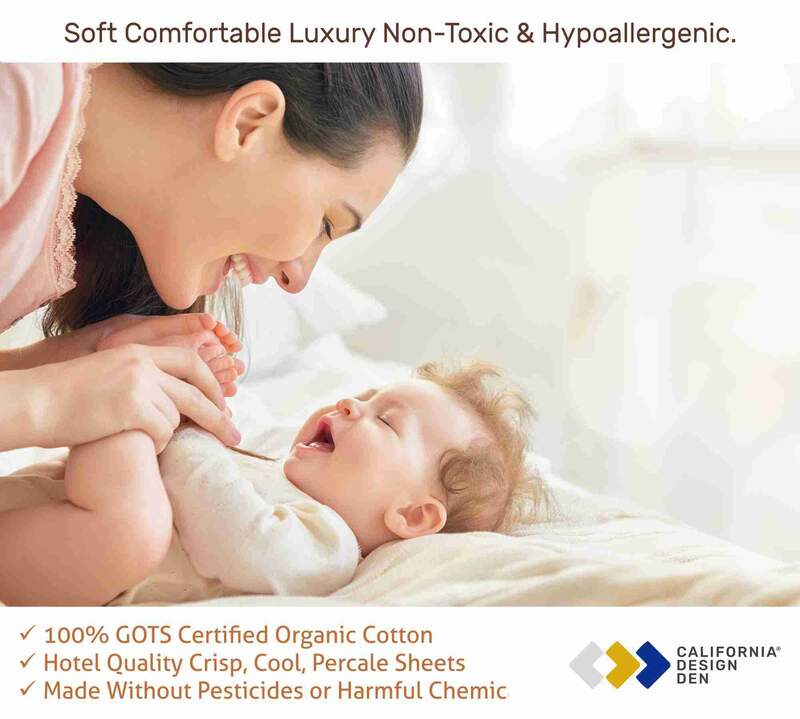 I am aware of the fact that these cotton sheets have been tested against harmful materials as well as numerous audits to ensure its compliance with everyday usage and industry standards. The material has also been subjected to shrinkage, and tear strength and found to score excellently on such parameters. The crispy coolness of these cotton sheets cannot be compared to other bedsheets I know, the relaxed appeal and soft finishing they produce to make them more desirable than any other material to me. In addition to the good price, this product comes with 100% satisfaction guaranty. Though I have no reason to contact the customer service since I bought these bedsheets, I am sure the customer service is superb too. The top-quality designs of this product match my interior décor, from the living room to the bedroom, and I have ordered some for my kids’ bedrooms because they deserve the comfort that cotton bedsheet offers. Ordering my cotton bedsheet from California Design Den was completely easy and straightforward. The Lush and soft high-quality bedsheets were delivered even before the due date and I am happy for the promptness of the delivery. The items were packaged and sealed in appealing packages and the staffs were very polite and helpful. I was able to unbox and start using the cotton bedsheets right out of the package without any irritation or discomfort to my skin. Aside from the bedsheet, the package also contains the warranty information alongside an instructional manual on how to use and maintain the product to maintain its lushness, softness, durability, and comfort. In conclusion, I will highly recommend this product, especially for those with normal or sensitive skin because the fabrics keep the skin dry, un-irritated and cool. It is a product that is very suitable for all seasons because it keeps you cool in the summer and warm in the winter. When it comes to price, this product is a great bargain for its value. I have used certain bedsheet brands in the past that cost more but never last long, hence I will say the price bargain is amazing. With zero maintenance cost and ease of cleaning, I do recommend these bedsheets for the busy mums who have little time to clean their beddings.